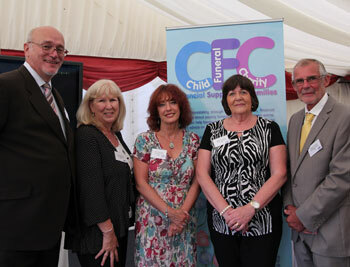 The chief executive of a new charity offering support for people who lose a baby or child said the support shown by the 100 or more bereavement professionals attending the launch far exceeded his expectations. The launch event was combined with an educational seminar on child bereavement called It’s Time to Talk, opened by author and advice columnist Bel Mooney, who is also one of the charity’s patrons. She spoke movingly of her own experiences of losing a baby and the shortfall in support and care that she experienced, which led her to become a key figure in the development of child bereavement support charities. The speakers also included representative of professionals who have contact with families before, during or after the death of their baby or child. The audience included nurses, midwives, bereavement specialists, managers of crematoria, cemetery and woodland burial grounds, and funeral directors. CFC will take referrals from professionals within the bereavement industry from October 1. They will be able to put forward details of any family who they believe needs help to cover the costs of a baby or child’s funeral. Once approved by the trustees, CFC will donate up to £700 per family, with the money being paid directly to the relevant suppliers. “The Child Funeral Charity was created because we saw how challenging parents often found it to successfully apply for the Government’s social fund to allow low income families assistance to pay for funeral costs,” said Roger. Several suppliers have already pledged goods and services to make it possible for the charity to source cost price or free items. Pictured are patrons Kevin Tomes, Anne Barber and Mary Tomes, with Bel Mooney (c) and Roger.